Jeff Immelt's company has been a disappointment lately. 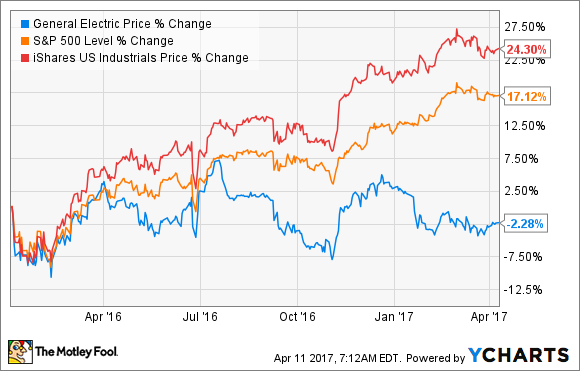 When GE reports results on April 21, it will be an opportunity to reassure investors that the industrial giant is back on track. The next few quarters are extremely important for the investment thesis for General Electric Company (NYSE:GE). The stock has significantly underperformed the S&P 500 and the industrial sector over the last year or so amid fears that the company might miss its target of $2 in operating earnings per share. After a 2016 in which revenue estimates were significantly lowered throughout the year, investors need to see a few quarters of stabilization in order to regain confidence. In this vein, let's analyze what to look out for in GE's first-quarter earnings on April 21. The disappointing full-year organic revenue in 2016 -- management started the year expecting growth in the range of 2% to 4%, only to end up with 1% -- hit the stock hard over the course of the year. In this context, the first thing investors should look for is at least maintenance of the full-year 2017 organic revenue growth target of 3%-5%. Any guidance toward the low or high end of the range will also affect sentiment toward the stock. It's no secret that the company's oil and gas segment was the chief culprit behind the disappointment in revenue last year, but there is reason to believe that the headwind from oil and gas could turn into a tailwind this year. 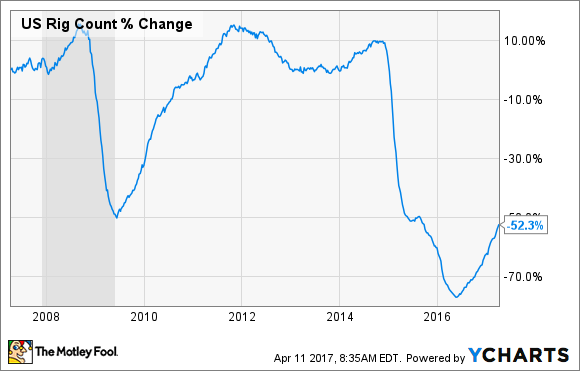 As you can see below, following a series of dramatic declines, equipment orders finally turned positive in the fourth quarter of 2016. Given that other industrial companies with heavy oil and gas exposure such as Dover Corp have reported improving conditions in the oil and gas market, along with the ongoing recovery in rig count, there is reason for optimism -- particularly given the chances of increased exposure to oil and gas capital spending that will come with the Baker Hughes Incorporated (NYSE:BHI) deal. GE can't completely hide behind weakness in oil and gas as an excuse for weak revenue growth in 2016, however. In fact, an analysis of the fourth-quarter earnings report demonstrates some weakness in the power segment. There are two specific issues. First, the 104 gas turbines shipped in 2016 fell somewhat short of internal expectations for 110 to 115. One reason for the shortfall is that six shipments expected in the fourth quarter didn't close, but are expected to in 2017 -- something to look out for. Second, as you can see below, GE has been relying on Alstom equipment order growth in recent quarters in order to counter weak core (excluding Alstom) power orders. Moreover, gas turbine orders have lagged sales in the last few quarters, indicating slowing growth to come. Data source: General Electric Company presentations. LHS = left hand scale. RHS = right hand scale. Investors will want to see power equipment order growth in the coming quarters. Having discussed equipment orders in two segments, it's worth reflecting on overall equipment order growth. While overall infrastructure orders were only down 2% in 2016, if you exclude the contribution from Alstom equipment orders, GE's core orders were down 21% in 2016. Moreover, a look at the four key segments suggests equipment order weakness in 2016. Data source: General Electric Company presentations. Year-over-year growth. GE's orders tend to bounce around a lot, though, so don't be surprised if they turn positive in the next quarter or so -- and investors need to see this to feel completely confident in the company. Last but not least, there is the potential for better-than-expected profit contribution from the energy assets acquired from Alstom and the to-be-completed merger of GE oil and gas with Baker Hughes. Observant readers will note that GE's growth has been boosted by the contribution of the Alstom assets and the creation of cost synergies from the deal. Indeed, there is a case for buying GE based on internal execution with Alstom/Baker Hughes alone. As it stands, CEO Jeff Immelt is expecting EPS contributions of $0.09-$0.10, and $0.18-$0.20 in the next two years from the former Alstom energy assets. Meanwhile, Baker Hughes is expected to cost GE $0.02 in EPS in 2017, but then contribute $0.04 in 2018 and $0.08 in 2020. In other words, together they are expected to contribute $0.22-$0.24 in EPS in 2018 -- that's a significant chunk of the $2 in operating EPS that Immelt is targeting. If there is any upside -- say, expected cost synergies from the integrations -- then it could benefit GE shareholders significantly. General Electric Company investors will be hoping that the company's fortunes can turn up. Image source: Adam Senatori for GE Reports. All told, it's an important set of results for the company, and investors will be hoping for some good news on equipment order growth, not least because it should lead to increased services growth down the line. Meanwhile, execution with the integration of Alstom -- and estimates on Baker Hughes -- provide upside potential. The bottom line is that GE needs to hold or raise its revenue guidance. Investors will feel more comfortable after that.